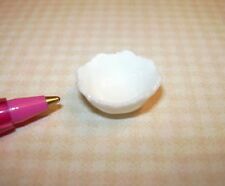 This is a very pretty, finely scalloped edge white porcelain bowl handcrafted in dollhouse (1:12) scale by "Falcon Collectibles" miniatures. 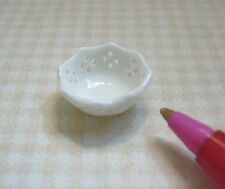 Pretty Scalloped White Porcelain Bowl (#3): DOLLHOUSE. This is a dollhouse (miniature) item. This is a very pretty pierced white porcelain bowl handcrafted in dollhouse (1:12) scale by "Falcon Collectibles" miniatures. 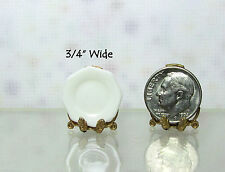 Pretty Pierced White Porcelain Bowl (#5): DOLLHOUSE. This is a dollhouse (miniature) item. 1:12 Scale Adult Dollhouse Miniature. This is an Adult Collectible Dollhouse Miniature and is not intended for Children. Feel free to request a photo of any item for clarification. White Ceramic Chocolate Pot with Removable Top. 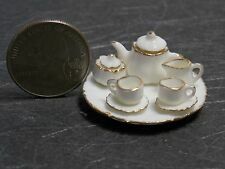 This dollhouse miniature quality Porcelain Saucer is 7/16" Wide and with the cup is 5/16" Tall. It is sure to make a nice display for the table or setting for a favorite cup of coffee or tea. Petite but nicely detailed. 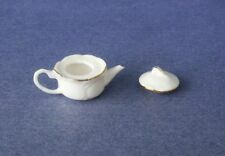 This dollhouse miniature quality Porcelain Saucer is 5/8" Wide and with the cup is 3/8" Tall. It is sure to make a nice display for the table or setting for a favorite cup of coffee or tea. White Porcelain Cup & Saucer Set.